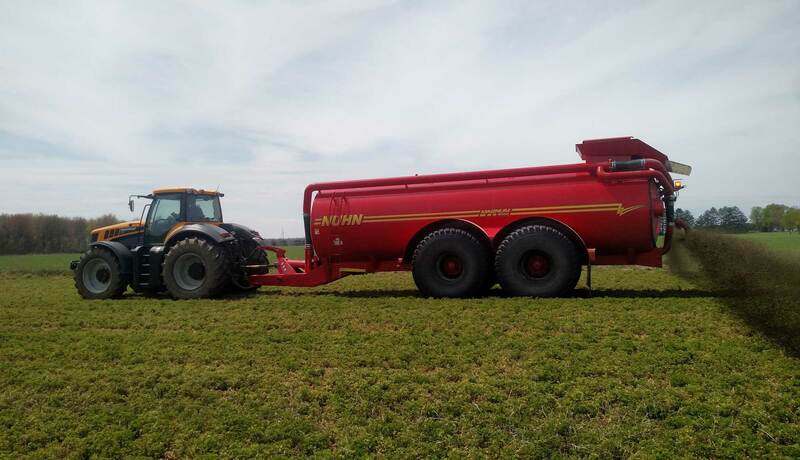 Magnum Top Load — Nuhn Industries Ltd. 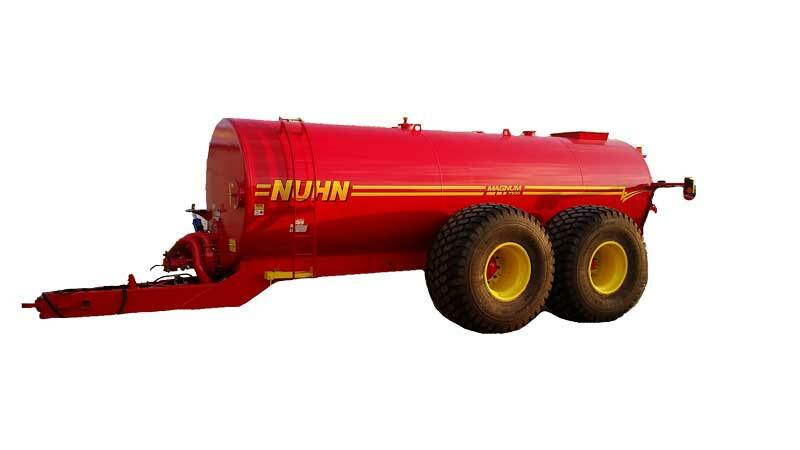 The Nuhn Magnum is the workhorse of the industry. Simple. Rugged. Reliable. Most tanks on the market use a standard PTO shaft. If the tractor turns at 45°, the combination of angles in both universal joints must bend an equivalent of 45°. The best geometry is achieved when the distance between the draw pin and the PTO of the tractor is the same as the distance between the draw pin and the shaft of the spreader pump. This gives 22.5° at both ends. When a long power shaft, such as 48” is used, very little bend happens at the spreader end, and the rest is made up at the tractor end. This creates excessive angles, chattering on turns and shortens PTO life. Also, the PTO in the tractor may be damaged. 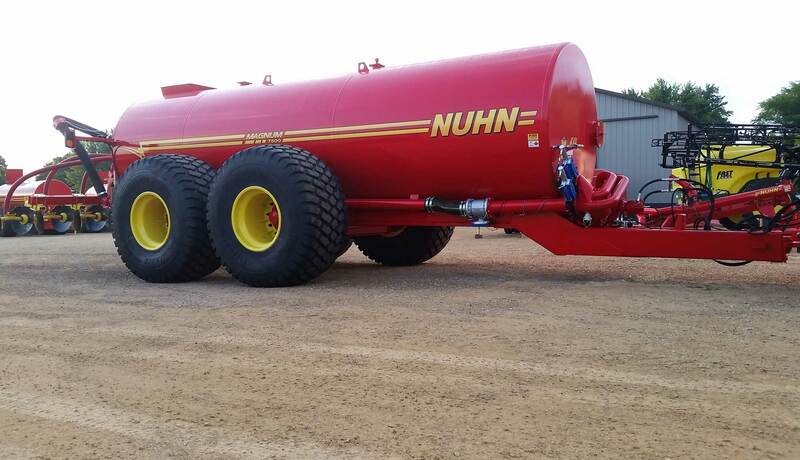 The ¼” tank with unibody construction, solid welds inside and out, and full circle tensioned baffles are what makes Nuhn tanks unbeatable. The circular shaped tank keeps the center of gravity low, as opposed to a mushroom shaped tank with the center of gravity very high. The tank has a full light kit, with the lights to the outside of the tires and are designed to break away if they hit something. There is a large clean-out door at the rear of the tank. The tank has full cross members and a 1/4″ solid construction frame. Nuhn full cross members create a cradle for the tank, and bridge the tank and the two side frame pieces together. Other systems with just the two rails and no cross members have no structural integrity between the two rails. The tank also has extra support where tandem joins the frame. Nuhn invented this system 20 years ago. The Nuhn self-load system is switched hydraulically and the diversion is all incorporated into the front pumping system. The transfer areas are very short. This prevents solid materials from settling and in rare cases, blocking the discharge pumps. Other spreaders on the market have a much longer inlet pipe. The tank has solid alloy spindles, which are welded directly into the main beam, eliminating weak points. Most tanks in the industry have its spindles mounted with a series of several parts on the end of the beam. This tank also comes with large diamond tread tires and has the heaviest axle in the industry.